A super versatile soup that can be served at room temperature or chilled. Forgo the mint and experiment with different fresh herbs like dill, parsley or oregano! In a large skillet, melt butter over medium heat; add leeks and saute for 5 minutes. Mix in cucumbers; saute for 1 minute then remove from heat. Add leeks, cucumbers, milk, lemon juice and mint (or selected herb of your choice) to a blender or food processor; puree for 1 minute. Add pepper and salt to taste; blend together. 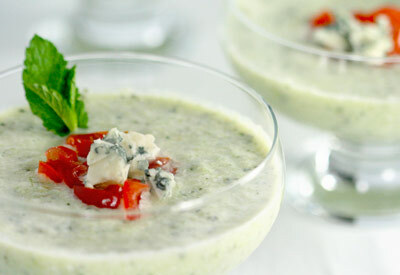 In a separate bowl, mix yogurt and honey together; fold into cucumber soup. For best flavor results, chill in refrigerator for 1 hour. When ready to serve, ladle soup into four bowls. Garnish with 2 tablespoons of tomatoes and 1 tablespoon of cheese crumbles in the center of each bowl.